Riding my bike a few weekends ago past the new Skytrain Sukhumvit Line extension (more about that later), I crossed this khlong, or canal, near the Third Stage Expressway. Bangkok has long been referred to as the Venice of the East, although most of the canals have either been filled in to make roads or are stagnant dumping grounds. 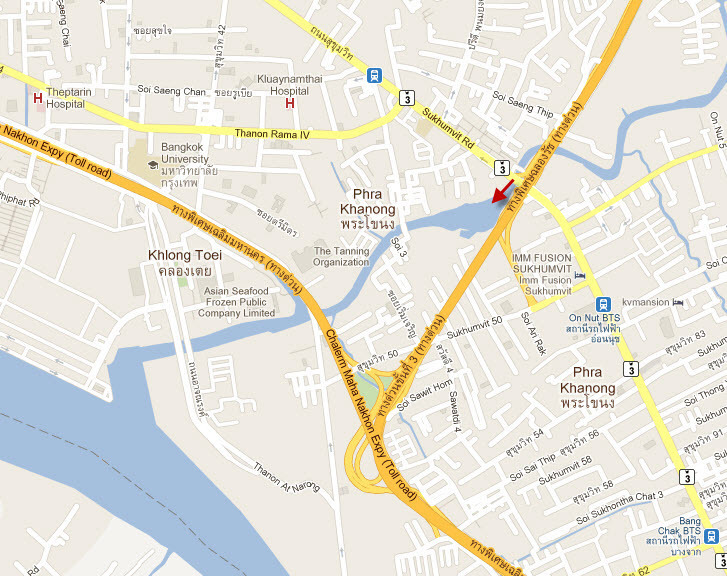 This canal, though, flows unimpeded to the Chao Phraya River and seems to benefit from a twice-daily flushing by the tides. The arrow on this map illustrates the location and direction of the first photo. It is charming that there are still communities that live on the edge of the water, whose land has not been expropriated for development into condos, hotels, and office buildings. Of course, in some areas, those are the poorest communities and homes are little more than corrugated tin shacks. In other areas, such as the Phra Khanong community in the first picture, residents are of modest means but their community is long-established with solidly-built homes and shops. This entry was posted in Uncategorized and tagged Bangkok, canal, Khlong, Krungthep, Phra Khanong, Thailand by christao408. Bookmark the permalink. that’s actually one of the things I’ll always remember about my home country – it’s the corrugated tin shacks and how they sounded whenever it was raining. on one hand, it’s such a great reminder of home…but on the other hand, you know your life is probably sucking big ones if that’s the only thing keeping you from the elements. They say Marco Polo brought the idea of pasta from asia to Italy. I wonder now if East Venice might have been in the works too? I like the idea of the canals. Seeing some ordinary homes still there is excellent. Find a canal here – I am surrounded by them in Florida but we call them bays or inlets, and you find the condos that you and I could not afford. I did enjoy my time in Venice, Italy. I roomed on the canal (what else)0 and hopped the gondola to work. speaking of venice, i might get a chance to visit there in april for a conference. i’m determined to go, before venice sinks! I enjoy the canals in Venice, China, and Los Angeles,. For the last one, it is a lol, hehe. I just got back from visiting Venetian hotel in Las Vegas. I remember the busy Bangkok river, glad you share with us about the canal. hope the city spend some efforts to keep this one clean and open. @CurryPuffy – Actually, that’s not an isaldn, but just a point of land. The waterway on the left sort of dead ends and the one to the right goes all the way to the river. @kunhuo42 – Fantastic news! I’ve heard that it is best to experience Venice in the evenings after the daytime tourists have gone. @stevew918 – LA has some canals in the Venice Beach area, right? @grannykaren – Thank you; I realized that it wouldn’t be too hard for people to guess. @Fatcat723 – Gondolas – an underappreciated form of transportation. =D@The_Eyes_Of_A_Painter – My understanding is that most of the canal work in central Thailand is only about 200 years old as most of the projects were initiated by the kings of the early Rattanakosin period, which coincides with Bangkok’s founding in 1782. @ThePrince – My maternal grandmother grew up in a house with a corrugated tin roof. As a young child we would spend parts of our summer vacation down there and I remember the sound of the rain falling on the roof at night. @christao408 – yeah – it’s awesome isn’t it? it really takes me back to days gone by. man, time is merciless. Yes, Chris. The look and feel there are very different from others.